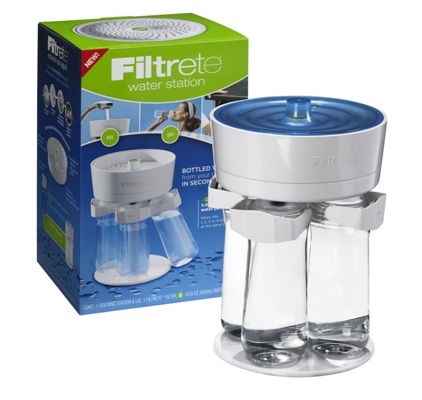 Filtrete Water Station Review & Giveaway CLOSED!! I dont know about you, but I am very guilty. I am guilty of drinking bottled water. I am hooked on the stuff. Yes I do know that those plastic water bottles are not any good for our environment, so I do try to fill up my bottles with tap water, but for one our tap water is nasty. The city water here is not tasty at all and I do have a water filter for better tasting water, which I do use. But when I am just out doing stuff in the yard or running out to do errands, I will grab a new bottle of water and with this hot summer maybe put a couple in my purse. Oh then when I am running around with the kids, I might grab a few bottles so they can have something if they get thirsty as well. I know I should be ashamed of myself, but sometimes being a mom, you get so busy that you think you dont have the time to refill some bottles for you and your kids. I had this way of thinking for quite sometime, that is until I received the Filtrete Water Station by 3M. I love this contraption. 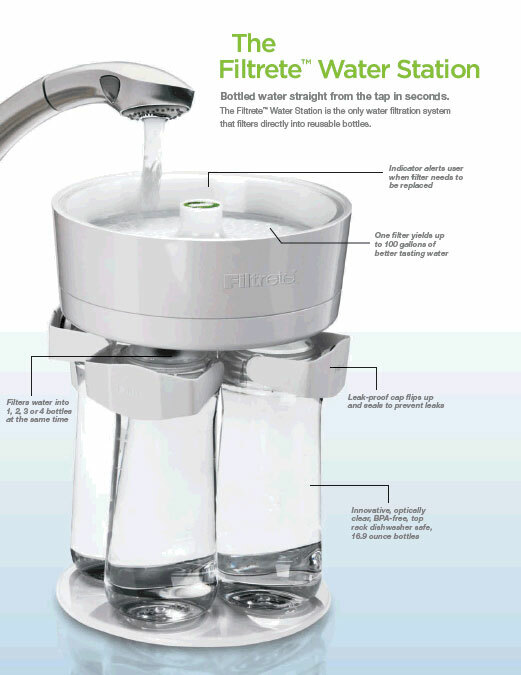 It is so easy to set up and use, my kids can use it and refill their bottles for water all by themselves. Well my daughter at least. My son needs to be watched, but he loves using the water station to fill up his water bottle!! And I would have to admit that I am hooked!! I love that to fill up my water bottles, I can fill up the water station with tap water, then it fills my water bottles!! So instead of getting impatient and waiting to fill up one bottle at a time, I can fill the four reusable bottles in just a few seconds, and it tastes the way water should! Well the wonderful people from 3M would like to give one of my amazing readers the Filtrete Water Station!!! Tell me what you can do to or have done to help the environment! Also leave me your email with this entry!! This giveaway is open to US residents. This giveaway will end at 11:59 pm on July 9,2011. Winner will be chosen at random.org and will be given 48 hours before another winner will be chosen. All products for reviews and giveaways are given as a sample from the companies. All opinions in reviews I conduct are my own. I was not paid to say anything or review any products. Recycle and our family worked on local service projects, planting trees. we recycle everytihing we can and always use eco friendly water bottles for all our beverages! followed you via twitter.courtnut1990@yahoo.commsfreebiequeen — twitter. I use TOO many bottles of water, for some reason my body doesn't like tap water, my kidney really starts kicking after I drink it. I do recycle my plastic bottles since they are so many. I also have a tankless water heater, works great, takes up way less room than the regular water heaters, and is not digging a hole in my pocket. We Recycle all aluminum cans, use Freecyle to give away household items we do not use any more, Wash & reuse plastic water bottles, roll newspapers into fire logs for winter heating & feed all food scraps to the livestock. Hardly anything goes to waste! I bike to work everyday! I live about a mile away, so I'm getting great exercise, saving money, and saving the environment. I do a lot, I hope, like cloth diapering, cloth pads, and Unpaper Towels. Tweet: https://mobile.twitter.com/hiphoppapatamus/status/86446395611025408Chanellerf at gmail dot comThanks!